Happy Monday after Thanksgiving, friends! I hope you had a wonderful holiday filled with loved ones and pie. The husband had to work over Thanksgiving so our holiday was really low-key, but I kind of liked it. We had a small turkey dinner (complete with the can-shaped cranberry sauce and the most delicious roasted garlic mashed potatoes I’ve ever made, IMHO), I got some extra hangtime/cuddle time with the tot, we trimmed the tree and decked the halls and, at long last, busted out the Christmas station on Pandora. If you’ve been following along on Snapchat, you also know that we ate Thanksgiving leftover salads, watched the National Dog Show and practiced our Riverdancing. You know, normal holiday weekend stuff. 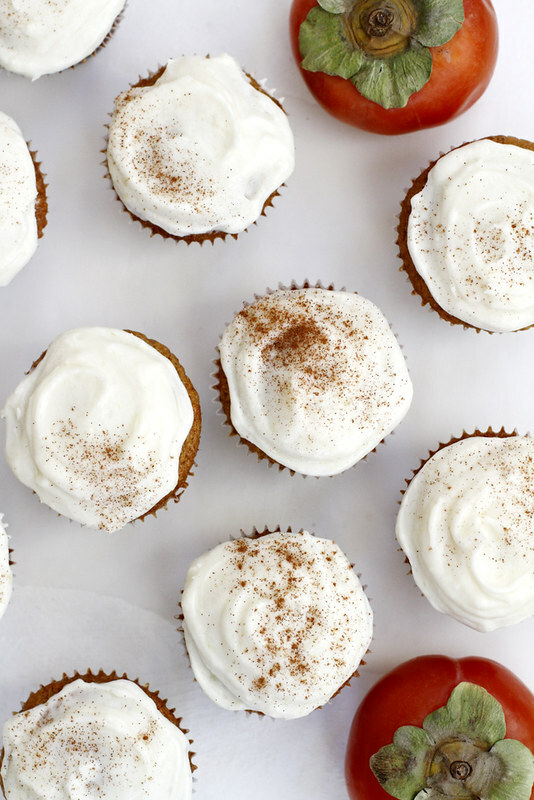 What our weekend did not include, unfortunately, were these delicious persimmon spice cupcakes with vanilla ginger buttercream frosting, and that is because we already ate all of them. My excuse is that I needed to make room in the fridge for the pecan pumpkin pie, so I had to finish them all. Of course, that wasn’t at all hard to do when tender, warm-spiced, persimmon-flavored cupcakes topped with gingery buttercream were involved. I’m one of those buy-persimmons-once-a-year kind of gals (mostly because they’re in season for approximately threeve seconds), so when I do buy them, I want to make sure I use them well. 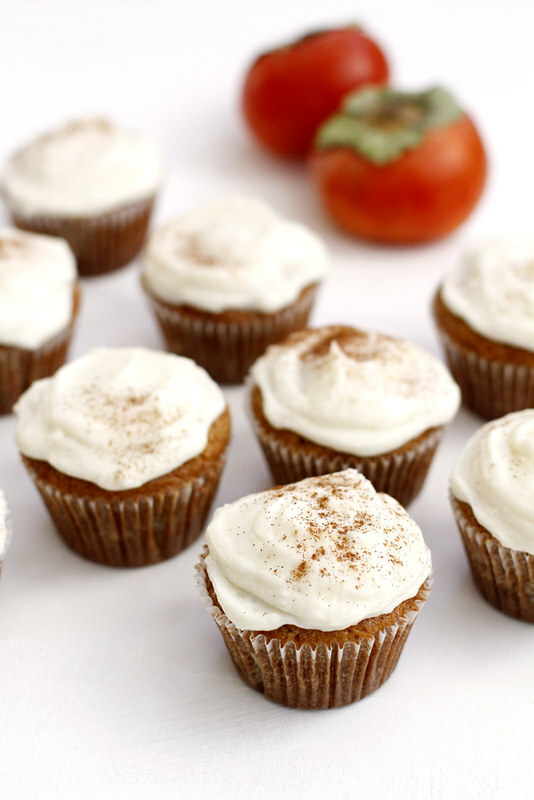 Of course, slicing them and eating them on their own or putting them on top of salads is all fine and dandy, but when you can put them into cupcakes, why wouldn’t you? And since ’tis the season to be merry (a.k.a., eat sweets with a little more abandon, amiright), I think these cupcakes would be great for holiday party spreads. Or for Santa on Christmas Eve. Or both. Head over to the KitchenAid blog for step by step photos and the full recipe! And have a very merry Monday. Steph, these look amazing! I actually just bought persimmons for the first time at the store yesterday, and have no clue what to do with them. I am thinking these cupcakes need to be in my near future!! So happy to find you on Snapchat!! Also, these cupcakes, so actioning!! Persimmons are so delicious right now. What a great way to incorporate them! I’ve never bought a persimmon! What?! Now I must! My Nonno grows persimmons and we always end up with a box full. They would always go to waste because we could only eat so many and didn’t have any recipes to use them in. This recipe is a great idea. Thanks! I’ve been dying to make something with persimmons but I’ve been uninspired. These look super yummy!